The State of Play report released in Western New York last week identified a lack of youth participation in sports, despite a wide majority of parental appreciation of the benefits of physical activity by their kids. That report, as we previous reported, encourages a renewed interest in free play. It also encourages letting kids try a wide variety of sports, avoiding early specialization. Experts and even one former pro athlete share the opinion that intensive concentration on one sport at a young age is a mistake. WBFO's Michael Mroziak presents the second part of his two-part series on the State of Play report, focusing on kids and the (lack of) participation in sports and physical activity. Thurman Thomas played in the National Football League for 13 seasons, all but one of them for the Buffalo Bills. He is enshrined in both the Pro Football Hall of Fame and the College Football Hall of Fame. And yet while growing up, football was not his primary sport. 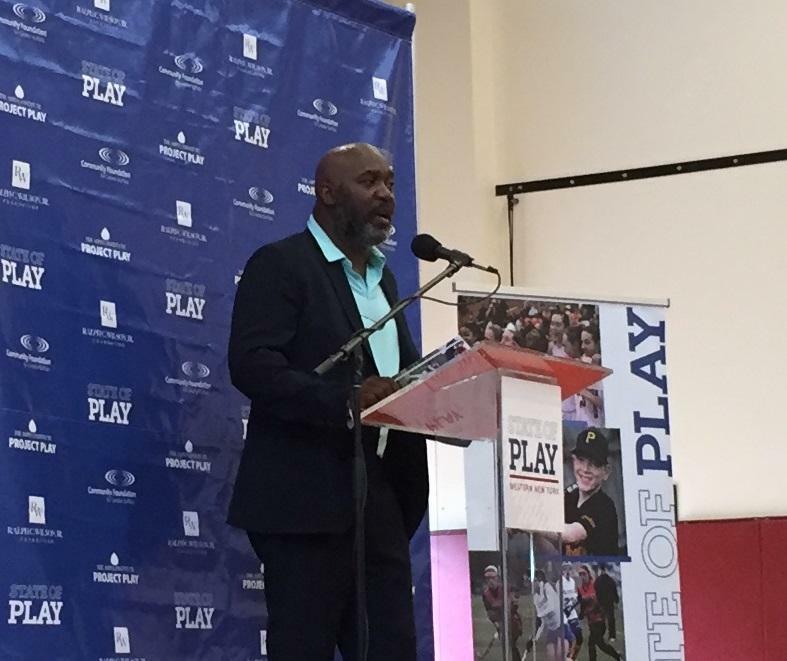 Former Buffalo Bills player Thurman Thomas speaks at the June 29 presentation of the State of Play report. The Ralph C. Wilson Jr. Foundation, in partnership with the Community Foundation for Greater Buffalo and Aspen Institute, prepared the report to study and recommend how to increase youth sports participation. Thomas was present on June 29 at City Honors High School when the partners who prepared the State of Play Western New York report released their findings and recommendations. He later explained to WBFO that after playing baseball for most of his youth, he got involved in multiple sports in high school, football included. "All the way through my senior year I played at least three sports, until my senior year," he said. He now strongly encourages his son to play multiple sports as he matures, for reasons including social development. Allowing kids to sample numerous sports is one of the suggestions provided within the State of Play report, which was prepared following months of surveys and research by the Aspen Institute, backed by the Community Foundation for Greater Buffalo and Ralph C. Wilson Jr. Foundation. Over the years, it has become more common to see youngsters become specialized in a single sport. Some parents feel this is how their child will best develop in that sport. But participants in the preparation of State of Play say the research shows otherwise. Tom Farrey, a former reporter for ESPN and now the executive director of the Sports and Society Program at the Aspen Institute, says tennis is one of the sports that has encouraged specialization at young age. But its top stars, he suggests, got to the top because they played diverse sports and picked up skills from those other sports. "Roger Federer played lots of soccer up through age 12 or 13," Farrey said. "Rafael Nadal, same thing. 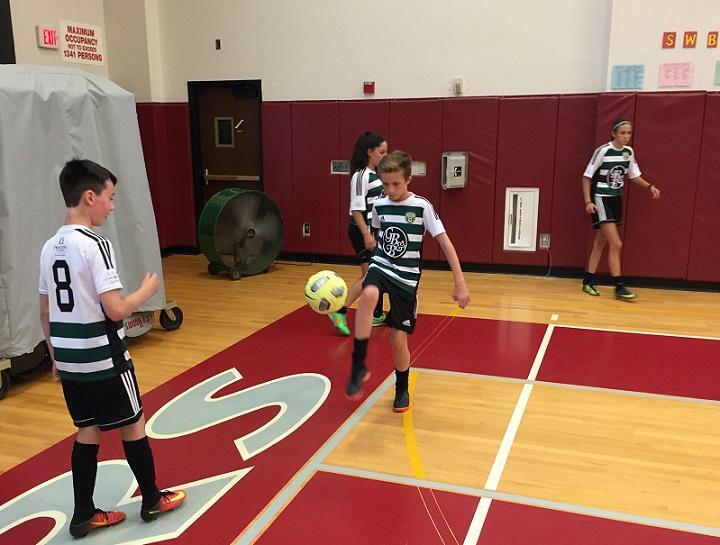 Their footwork comes not from being tennis players on a tennis court, it comes from soccer. That's soccer footwork you see. Novak Djokovic, lots of skiing. All of these people can talk about the benefits of multi-sport play, the development of basic... what we call physical literacy, fundmental movement skills." The State of Play study also looks into the availability of safe and good quality places to play. The report says there are plenty of places in Erie County but many could use revitalization. It's more challenging for kids living in rural areas. "Kids don't have transportation to many places, to go across town, to play baseball or be in a soccer league or whatever," said Mary Wilson, widow of the late Buffalo Bills founder and longtime owner Ralph Wilson, and herself an advocate for youth sports. "It's important to be able to be in your neighborhoods or in close proximity in order to be a part of a league or just go out and play." Public-private partnerships are one way to allow improvements or create new spaces. Farrey said many communities have dedicated additional tax dollars to such a cause but if a municipality prefers not to do that, options involving private dollars may involve naming rights to parks or other public facilities. Dave Egner, president and CEO of the Ralph C. Wilson Jr. Foundation, says municipalities should also explore development of facilities beyond the traditional baseball or soccer fields. The report, he told WBFO, shows strong interest by youth in skateboarding or bicycle-motocross (BMX) grounds. "When you start to dig in to why kids want that, there 's no coaches," he said. "There's no parents correcting their swing. There's no parent there to tell them the 50 things they did wrong or change the rules of the games. We've got to be a little more trusting that our kids can handle it." The State of Play surveyed parents and children in eight Western New York counties. It reveals that 84 percent of parents believe it's important for their kids to be involved in sports. But only 16 percent of Western New York kids are physically active at least one hour per day. Those who do play, according to research, perform better in school and are less likely to develop health problems including obesity, and are more likely to raise their own children with similar healthier habits. The foundations that backed the study and preparation of the report say they will make future investments to get more kids involved in physical activity but will only make those investments after the communities identify for them what needs are to be fulfilled. "If the Ralph Wilson Foundation walks into communities and neighborhoods and says 'here's what you need to do,' we've failed because it won't be owned in the neighborhoods," Egner said. State of Play, Part 1: How can we get more kids involved in sports? A newly-released report about youth sports participation in Western New York shows a lack of physical activity by many young people. But it also offers ideas on how to get kids more interested and involved with sports. It begins with a question for the children: "What do YOU want?" WBFO's Michael Mroziak presents the first installment of his two-part series on the State of Play in Western New York.